Lord Ahmed explained that he 'had the pleasure to know Lord King from 1999. I was a little senior because I was the first Muslim to join from 1998. He was the first Sikh to be raised to the House of Lords. He did two duties then both as a Lord and as a Councillor in Sandwell. 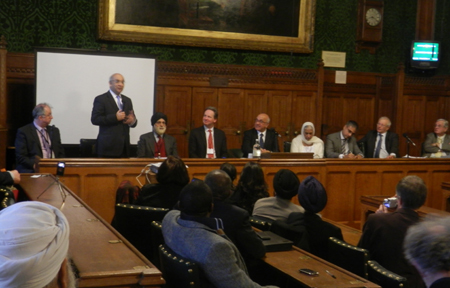 We would speak to each other in Punjabi in the House of Lords. He was such a gentle man. He was so softly spoken and he would never say no. When Robin Marsh or Margaret Ali asked me to attend meetings I would ask him (Lord King) "Do you want to attend all their meetings?" and he would say, "I cannot say no!" Keith Vaz quoted the poem ‘’If’’ by Rudyard Kipling especially the section ‘’Walking with kings - nor lose the common touch .." 'The Lord King was the man who exemplified this poem', he said.